The 2014 Inglis Australian Easter Yearling Sale has concluded with a first class 83% clearance rate in Session I and records eclipsed in Session II thanks to a diverse buying bench competing on top quality yearlings by a wide variety of sires. “We are very pleased to see the overall combined gross from Session I and II on par with last year at nearly $91 million. Vendors must be congratulated on presenting their drafts in such great order. Buyers were here to pick out the best of the best and we look forward to these Easter graduates hitting the racetracks around the globe in the coming years,” said Inglis’ Managing Director Mark Webster. 326 yearlings from Session I have been sold at an average of $252,873. The 83 per cent clearance rate is the best since the all-time highs of 2008. A new record Session II average of $94,922 has been set this afternoon, with 83 lots sold at a clearance rate of 77 per cent - well above last year’s figures. CLICK HERE to view the Inglis TV video wrap up of the 2014 #InglisEaster Yearling Sale. Rosehill trainer Gerald Ryan secured the top priced lot on the final day of the Easter Sale when going to $1,300,000 to purchase Lot 403 – a colt by Fastnet Rock from Gimcrack Stakes winner Defiant Dame that was offered from the draft of Coolmore Stud. The second highest price of the day was set in a record breaking Session II when Sheikh Mohammed bin Khalifa Al Maktoum outbid George Moore to secure the half-brother to Golden Slipper winner Mossfun for $750,000. The colt by Magic Albert was offered by Fairview Park Stud as Lot 523 and sets a new record price for a yearling in Easter Session II. For the second year in a row Shadwell Australasia’s agent Angus Gold has been the busiest of buyers at Easter spending $8,085,000 on 20 yearlings over the last three days. Shadwell’s buys from 2013 already include two-year-old winners Banadeer, Majmu, Tawteen and Qawaasem. Sheikh Mohammed bin Khalifa Al Maktoum purchased five lots for $4,375,000, while Hawkes Racing bought nine yearlings for $3,330,000. Other buyers to spend $2,000,000 or more at this year’s sale were New Zealand agent Dean Hawthorne (11 yearlings for $2,685,000), Hong Kong agent George Moore (six lots for $2,390,000), Hong Kong Jockey Club (seven for $2,170,000), Gai Waterhouse/ James Harron / Round Table Racing (11 yearlings for $2,105,000) and John Warren/China Horse Club (four lots for $2,040,000). 41 yearlings by Fastnet Rock changed hands for over $15,485,000 in Session One, but the super sire was unable to replicate last year’s record average. His progeny still sold extremely well at an average price of $377,683. Street Cry finished 2014 Easter as the leading sire by average (3 or more sold) with 10 yearlings selling at an average of $465,500. 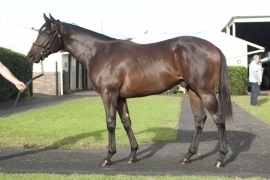 Next were Redoute’s Choice (22 sold at average of $380,909), Fastnet Rock (41 at $377,683), Choisir (four at $367,500), Snitzel (13 at $310,385), More Than Ready (30 at $278,167), Northern Meteor (24 at $249,479), Exceed And Excel (20 at $246,500), Magic Albert (five at $232,000) and Medaglia d’Oro (seven at $231,786). Horses passed in at the 2014 Inglis Australian Easter Yearling Sale are available for purchase via the Inglis Make-An-Offer Service. Coolmore Stud sold both the overall sale topper and today’s top priced yearling. The professional Jerry’s Plains operation finished at the top of the leading vendors list having sold 29 of their 32 yearlings for $9,180,000. Arrowfield Stud (26 sold for $7,610,000), Widden Stud (30 for $6,545,000), Kia-Ora Stud (16 for $295,938) and Kitchwin Hills (19 for $3,350,000) round out the top five vendors by aggregate. Cressfield Stud, Segenhoe Stud and Tyreel Stud finished Session One as the leading vendors by average (3 or more sold), recording averages of $583,333, $440,000 and $431,667 respectively.